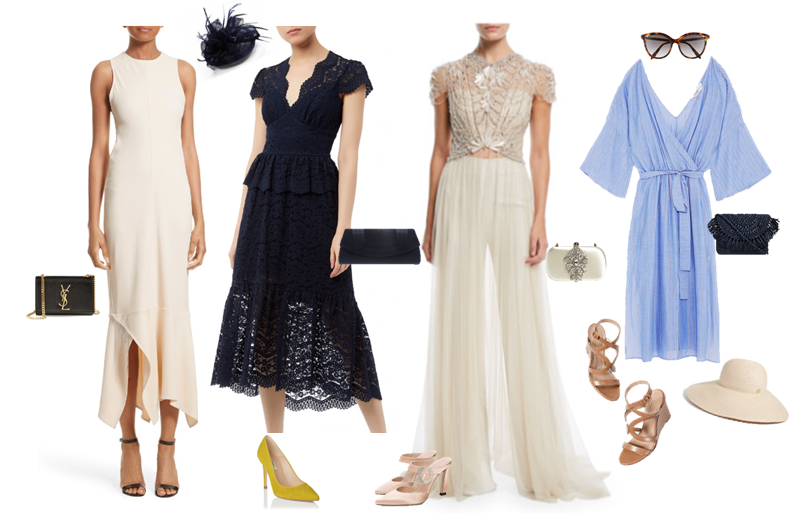 Four looks for Prince Harry & Meghan Markle’s wedding. If I was the bride I would wear cream or white to my rehearsal dinner. Couldn’t you totally see this on Meghan? She is known for bringing a modern American look across the pond, but what’s so great about this dress is that it’s actually designed by Victoria Beckham so Meghan would be proudly representing UK fashion and Harry’s close friends by wearing this label. My favourite detail is the fluttery hem at the knees. This might be my favourite look for a wedding guest to wear to the ceremony on Saturday. This Alice Temperley dress is modest yet feminine and sophisticated to wear to St. George’s Chapel. The fascinator plus the yellow heels round out the whole look and makes the dress bright and cheery for a spring day in England. Jenny Packham is one of Kate Middleton’s favourite designers and her go-to when it comes to dressing for special occasions so no doubt Meghan will probably be seen wearing this brand in the near future. I had to include this cap-sleeve crystal beaded top with a long tulle skirt and dress pants because it checks all the boxes for a statement look at a black tie affair. Isn’t it beautiful? We have also been seeing pants a lot on the red carpet lately, especially at the Met Gala this year. (Look here and here.) Meghan has also worn pants numerous times at public engagements so it’s safe to say she would be a fan of this look at her wedding reception! Kate Middleton is often seen wearing affordable items from the clothing line – Zara. I think Meghan will also follow suit and wear this popular brand so that young women can mirror her style. I couldn’t resist but throw in a summery belted dress that would be perfect for Sunday brunch after the wedding. Meghan is known for wearing belted coats and dresses and I think this particular dress would be right up her alley because it has the loose “boyfriend” shirt look that she likes. Hope you enjoyed my four royal wedding looks for the weekend! Tell me in the comments below if you will be waking up early to watch the festivities. Previous April: What’s in my cart?